Hello and happy leap year! Today on the Bo Bunny blog they are featuring layouts that use calendars as part of the design. I created this layout from the brand new Alora collection. I have to say this is my favorite collection Bo Bunny has every come out with! It is AMAZINGLY cute! I printed a calendar page on 8 1/2 x 11 cream cardstock and then trimmed it to 8 1/2 by 8 1/2 to use as my back ground. The title is a play on the calendar theme, but very true! Thanks for visiting and Happy Leap DAY! A few days ago Bo Bunny feature projects made with papers ruffles. This is one of my favorite things to do! The DT created layouts and cards with all types of paper ruffles. Here's mine with a paper ruffle below the title. To create the ruffle I cut a 1.5 wide inch strip of paper and folded it along the length. I then sanded the edges of the folds with sandpaper, adhered it to the page and cut off any extra. 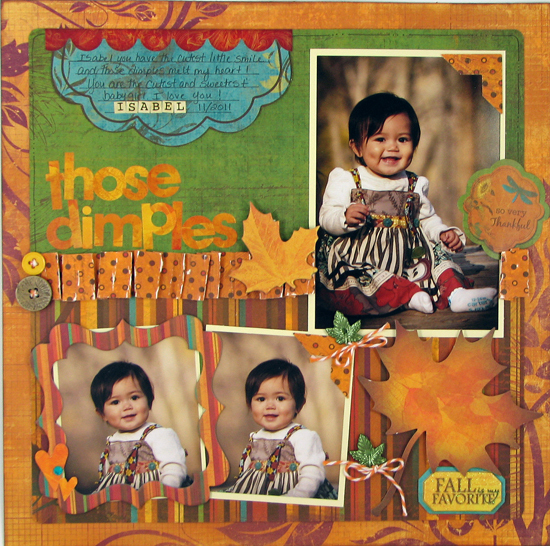 That's my sweet Isabel and her super cute dimples! I used the Bo Bunny "Forever Fall" Line on here. Get your Nikki Sivils "Box of Love"
Nikki is selling a Box of LOVE for Valentine's week! That's right... a box chalked full of paper love that you can buy for only $16.65 (shipping is not included) with product worth over $35.00 retail value!! There will also be some "extras" for you (each box will have different "extras")! Extra's may include: paper, stickers or journaling tags. **You do not need a pay pal account to purchase your Box of Love. Check out Nikki's blog for details. Today is Fast Friday on the Bo Bunny blog. I have this layout to share that can be completed in no time. 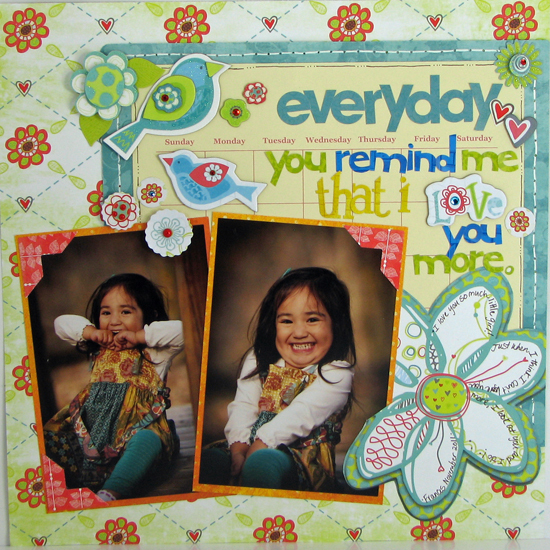 To create this quick layout I used lots of pre-made embellishments such as layered chipboard and dimensional stickers. I then did some quick journaling on my computer and attached to the layout. Everything on my layout is from the Bo Bunny Et Cetera collection. Thanks for coming by the blog tonight!